Hello from the CosmicBreak Service Team. Weekly Update is complete! Limited Garapon will be available for 4 weeks, until 8/8. *The Limited Garapon does not have the Slot System or Surprise System. The High Mega Garapon SP & Delight Garapon (& Delight Tickets) will also be able 4 weeks, until 8/8. The Premium Delight Garapon will be available for 2 weeks, until 7/25. The Precious Ticket Garapon only includes Gold balls. The Precious Ticket Garapon will be available for 4 weeks, until 8/8. You will need a 1 Precious Ticket to roll this garapon. A Precious Ticket can be bought for 160Rt in Shop. 1 Precious Ticket can be bought per account. Precious Tickets will be deleted from your inventory in 4 weeks, on 8/8. Cast your ballots (Preliminary Ballot 2017) for your favorite among the characters and try to bring them to the top! The top five popular humanoids from each Group will move on to the Final Voting Phase. *Ballots will be totaled with JP Server & TW Server for each phase. *Ballots in your inventory will be deleted after EACH phase! *Results of the Final Voting Phase will be totaled with JP Server & TW Server for the FINAL RESULTS. - Receive 1~4 ballots for completing a Union Wars room. Receive 1 extra if our team wins. - Receive 1~4 ballots for completing an Epoch Battle. Receive 1 extra if our team wins. - Receive 1~3 for winning in a Chaos Event Room. - Sometimes receive 1 ballot for completing a Legion Room. - Receive 1~4 ballots for completing a Victory Order Room. Receive 1 extra if our team wins. - Sometimes receive 1 ballot for clearing a Mission. - Sometimes receive 1 ballot for clearing Quest Arcantus. - Receive 1 ballot for clearing Quest Bastagant (Lv1 or higher). - Trade 10 Victory Orders for 1 Ballot at the Victory Order Shop. *A Limited edition will be made of the the #1 Humanoid. *Players who vote at least 100 times will receive a small gift at the end of the event. You can keep track of the number of times you voted by counting the Participation Tickets you own in your Garage. Speak to NPC Fractulus Girl to exchange your Victory Orders! Kururu Added to Shop for a Limited Time! Robots in Shop for a Limited Time! These robots will be available in Shop for 1 more week. IMPORTANT NOTE: Since the addition of Bazaar to the game, we have been receiving an increased number of reports regarding accounts being stolen and/or cleared out due to password sharing. REMEMBER, NEVER TELL ANYONE YOUR PASSWORD!!! If you lose items/robots from your account because you told somebody else your password, it is highly unlikely that we will be able to help you, especially if the incident involves said items being traded away via the Bazaar. Thank you in advance for your understanding. Happy trading! The Regular Clan Fights scheduled are 7/2, 7/15, 7/22, 7/30, 8/5, 8/12, 8/20, 8/27 at 19:00 - 20:30 server time. To participate, register your team from the Clan Fight screen after the event has started. Teams that register will be automatically matched up with each other. - Remember that "5x Gara Tickets" are removed from your inventory before every new garapon. - Deluxe Coin C has temporarily become unusable. - [It] Login Cube Alpha Cube, Battle Challenge Cube Alpha will be deleted 7/18. - The Deluxe Coin from Union Wars Battle Campaign will be deleted on 7/25. - There was a bug in which ballots were not dropping properly during Phase A. This bug has been fixed. - Slot numbers for Scaregant, B. Spinel, Hatigarm in Shop as been updated. - Ammunition cost decreased to 0. - All Guard effect applied after activation. - Barrier effect added to projectile attack during activation. - Assault Step has been made default equipment. - Force increased when equipped to both arms. - Slow Turn effect can be applied when entranced. - Crimson Veil effect bestowed during combos. - Momentum during melee attacks increased. - Directional keys can be used to move. - First projectile effect radius increased. - Combination attacks possible when equipped to both arms. 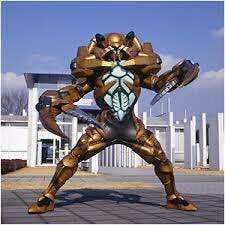 ・Kururu Gradd's Spike Shooter's "SPIKE GATLING" has been modified to have a shorter cooldown and no longer operates with other weapons. - Cooldown reduced and no longer operates with other weapons. - Cannot be used during Alpha Strikes. - All Guard effect bestowed when entranced. - WB damage received reduced to 1, HP changed to 5. ・Elcott BD2's "G-MOVE" has been adjusted as follows. - No longer activates without sub-lock. - Crimson Veil effect bestowed while active. - Ammunition cost set to 0. - Backstep shot changed to left click combo. - Combo increased by 1 hit. - Backstep shot changed to move along the ground. - First projectile deals melee damage. ・Main weapons that bestow 99% damage reduction have had their effect duration increased and cooldown time decreased. The following characters are affected. - Charge time reduced, cooldown time increased. - Cooldown no longer modifies that of other weapons. - Activates when HP drops to 80% or lower. - Break temporarily bestows invulnerability. ・The following Mighty Byne Girl (Extra Origin) shields have greater durability. - Successful attacks bestow the Chain Guard effect. - Attacking in midair no longer causes your altitude to drop. - Crimson Veil effect applied during Combos. - Animation lock after attacking has been reduced. - Jump height during combo has been reduced. ・Fixed a bug in which Amelia Leopold's WB would be unable to move even after the WB expired after receiving the Extend Support effect. ・Fixed a bug in which equipping Wonder Extender and Wonder Extender + to 2 units in your commando and using them in turn would allow for unlimited WB duration. ・Fixed a bug in which Summer Banner ALPHA's hitbox would be larger than expected. ・Fixed a bug in which dispatching Abyss Jikun Hu would qualify in dispatch missions requiring female units. ・Fixed a bug in which Margrethe's Quarrel Thorn@'s Force values didn't match what was displayed. ・Fixed a bug in which Angel Coins could not be traded via the Bazaar. ・Monica Gold AM10's "CHARGE CANNON" had higher Force values than what was displayed. for Elcott, the only problem is that she still doesn't have boost run. btw, gonna vote for Elcott on group B. Wait... so she doesn't need the Crimson Veil core tune anymore? Annnnd I should be getting my vidcard within the week. I guess I'll find out. Yes, it's superarmor which is practically CV without the icon it's kind of an hidden buff. There's just some frames in Mai's combo in which she jumps that don't have the buff but the rest of the combo has. I used to spam the offer wall up to 3k RTs but that wasn't and will never be my *only* option. Kuhl 133 anything new about him? that her main weapon has less force, but it shots multiple spread projectles, like a shotgun. Meanwhile nobody even read abt. the Ult. Moni buff. Depressing. I simply don't understand how good it is since I don't even know these moniggas to begin with. It wasn't that good anyway, they basically tried to make her close range defence weapon into Icy GL with range tunes and barely touched the cannon which just can't hold out against modern airs at all, plus her capa just isn't enough to tune both weapons enough to make them work without making her severely overweight. As usually they half assed it and ignore the things that really needed changes. so i conducted a few test involving deckshots and the new "CV" buff to the melees. Its only during attack frames that they have super armor. if you hit them at the end of a swing, they can still get stunned. its a split second thing.